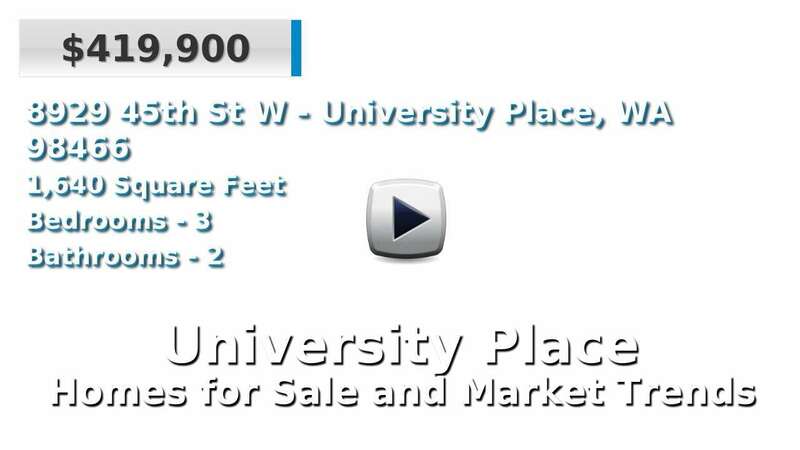 University Place was once a part of Tacoma but today is its own city of 31,000 people. It is located west of Tacoma on the Puget Sound and is part of Pierce County. Largely suburban, this area is notable for its convenience to major cities such as Tacoma, Seattle, and Olympia, but offers waterfront homes for sale away from the urban centers. This city is best known for its renown Scottish-style golf course named for the water on which it sits, Chambers Bay. Plenty of outdoor activities, including a walking path adjacent to the golf course on the bay, retain exquisite views of the Puget Sound, Mt. Rainier, and the Olympic mountain range. 4 Beds | 2.5 Baths | 2305 sq. Ft.
2 Beds | 2.5 Baths | 2342 sq. Ft.
3 Beds | 2 Baths | 1910 sq. Ft.
3 Beds | 2.5 Baths | 2777 sq. Ft.
3 Beds | 2 Baths | 1504 sq. Ft.
3 Beds | 1.75 Baths | 1536 sq. Ft.
5 Beds | 3.5 Baths | 2196 sq. Ft.
4 Beds | 2.5 Baths | 2774 sq. Ft.
4 Beds | 2.75 Baths | 2688 sq. Ft.
2 Beds | 1 Baths | 754 sq. Ft.
3 Beds | 3.75 Baths | 2987 sq. Ft.
5 Beds | 3.75 Baths | 4917 sq. Ft.
5 Beds | 2.5 Baths | 2523 sq. Ft.
5 Beds | 2.75 Baths | 2736 sq. Ft.